This tub is set in this corner at a thirty degree angle to provide enough room for a shower, bidet, and toilet along the far wall. The flooring in this bathroom is a jade green and the view from this window and accompanying mirror is of the Hollywood Hills. 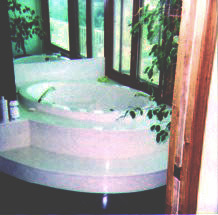 The radiused step adds a nice access to a tub that would have been lost in the corner. Here is a very interesting shower configuration where the shower control valve is set within a floor-to-ceiling column completely encased with cultured marble with the enclosure's glass on either side. 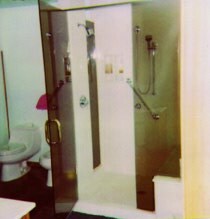 The shower seat itself is a continuation of the tub deck with the enclosure being the partition between the tub and shower area.